We're starting to near the end of our CES 2014 video coverage. With Episode One and Episode Two out of the way, we're down to one more massive video spectacle after this one. In this episode, we'll be kicking things off with a look at one of the stranger things InWin has shown off at CES 2014. Next, we check in with ASUS to see what brand new things they'll be tempting us with in the next while. Corsair has some updates their peripherals, Thermaltake has cases, power supplies, and cooling stuff. Finally, we return one more time to Cooler Master, to see what they're doing with their peripheral line up. This episode is packed with over 25 minutes of PC DIY goodness so grab a coffee...or two...and enjoy the eye candy! If you're having problems viewing the video on this page, you can find it here on our YouTube Channel. (00:20) - InWin introduces us to a new member of the family. Mr. Bubble, who hails from Taiwan, is a headphone holder that is both unique and eliminates some issues with current products on the market. Because it's shaped like a human head (albeit a small one) it prevents indentations caused by current products on the market. It also comes in a range of styles and will retail for around $60 USD. I'm thinking "Humpty Dumpty" here if he were to fall off your desk. (01:14) - ASUS showed off a trio of new products including their shiny new ROG G-SYNC enabled monitor. This is the first time the ROG brand has touched an LCD monitor, but it does look fantastic. Next, for ASUS ROG board owners, the have a new 4 inch LCD control panel for you. Although I was slightly disappointed that it wasn't a touch screen, it does offer some great eye candy. Finally, ASUS showed off their POSEIDON series GTX 780 graphics card which allows users to water cool or conventionally cool, without any modification. (05:00) - CORSAIR unveiled some updates to their Raptor series of peripherals including the launch of an entry level Raptor K40 keyboard and a new Raptor M45 mouse which is an update of the original M40. Finally, we get to see the star of the CORSAIR peripheral line up with is a new keyboard based off the K70 design, but features a brand new Cherry MX RGB switch. If you're into customizing, you're going to want to see this. More details in the official press release for the Raptor series along with the official press release for the Cherry MX RGB switches. (09:15) - Thermaltake was showing off some updates to their cases that allow for massive cooling. Both the Urban T81 and the Core V71 offer the capability to house both a massive custom water cooling solution, or a conventional fan based solution. It even has some ingenious ways to house more hard drive, especially larger 3.5 inch unites. The Urban series also receives two price point updates. Also covered are their new Digital Power Supplies which features a new app interface that was designed for ease of use, with useful information. There were even updates to their cooling line up with new cooling fans, new NiC series CPU coolers with even greater performance, but our personal favourite, was the new Alpha Stage Water Cooling Solution that allows users to start with a solid base level water cooling kit, that can update easily to higher end parts down the road. Details of these products are also available in the official press release from Thermaltake. (19:45) - Finally, we return to the Cooler Master suite at the Palms Hotel to check out updates to their peripherals including a new series of keyboards with a new key switch, new mice, and a new headset. We also hear about how their phasing out their CM Storm line to bring it back under the Cooler Master brand, and talk a little about how CM University is helping gamers get the right gear. 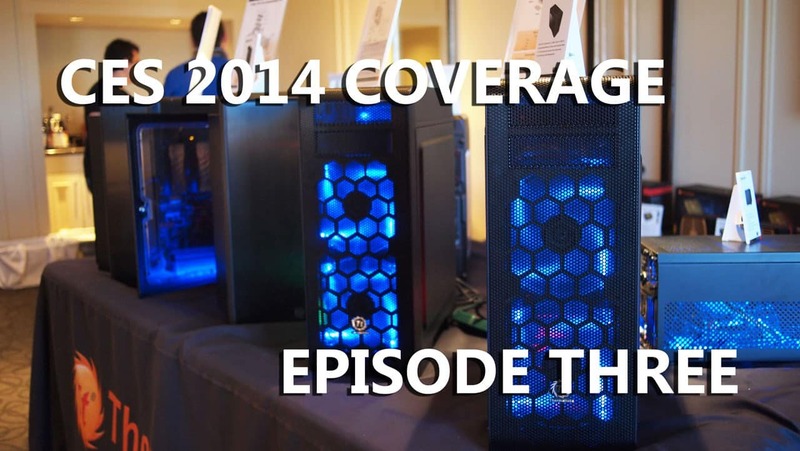 That's it for Episode Three of our continuing CES 2014 video coverage in FULL HD. And don't forget to check out Episode One and Episode Two. We've got one more Episode to put out, which will complete the quartet of videos from CES 2014. But until then, enjoy the previous trio and make sure you update yourself on all the news from CES 2014.